Having tall windows makes an impressive statement in your home, but thinking of ways to dress them can be daunting. Take a look at these 5 tall window treatment ideas and learn how to enhance your tall, stunning windows. When it comes to tall windows, the most traditional choice is drapery. For tall windows, drapery feels dramatic and regal. When you are choosing drapery, remember the scale of the room. A 2” diameter curtain rod will become lost on top of a 15’ tall window, so choose bigger drapery hardware and larger pleats for your drapes so you and your guests see the grand effect. Adding valances and tie backs gives you endless options to style your drapery. The drapery hardware is dramatic on these tall windows, helping to complete the look. I love how the mirror is perfectly inline with the drapes which shows how accessories can bring the whole look together. With so many ways to express a mood with drapery, don’t overlook using tiebacks, patterns or valances and other options to tailor drapery to your home’s style. If you like the fabrics of drapery, but want a more tailored look, try Roman Shades for your tall windows. Roman Shades are one of the sleekest window treatment ideas allowing you to achieve the luxurious feeling of a fine fabric without mounds of drapery flowing everywhere. You can raise and lower a Roman Shade to control the light flow into your room and the shade will draw the eye upwards when fully raised, making your room look even taller. If you want to add another layer of depth and interest to your windows, you can add drapery in addition to your Roman Shades. This is where a beautiful pattern can come into play. 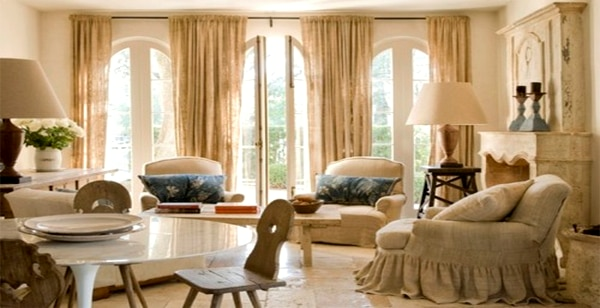 A solid Roman Shade will break up a patterned drapery and give your windows a complex, chic look. Cellular shades are a clean and modern look to consider as a tall window treatment idea. Their energy efficiency is perfect when the midday sun is streaming through your tall windows, keeping you cool inside. What is most amazing about cellular shades is that they are available in a top down/bottom up feature. The top and bottom of your shade move independently, giving you precise command of how much light is flowing into your home, preserving privacy without sacrificing natural light. For ultra tall windows, motorized shades will be your knight in shining armor. Motorized shades are an amazing window treatment idea for tall windows when you cannot reach the cord and you certainly don’t want to rappel up a ladder or constantly pull a cord up and down until your arms give up. Even if you are a regular “gym rat” your tall windows don’t have to be your daily workout! Because they eliminate cords, motorized shades are also a safe choice for homes with children and pets. Nothing says modern like having your shades flawlessly move up and down at the push of a button, letting you control your shades from anywhere, even your bathtub! Motorized shades are the number one choice in tall window treatment ideas to create a sleek and modernized look for tall, picturesque windows. Whether you dress them up or down, tall windows are always going to be a focal point in your home. Each window needs to be pampered, so take advantage of these impressive canvases of light and use these 5 tall window treatment ideas to show off your style.